Vegetarian cuisine has long moved beyond the dried-beans and nut-loaf regime, and people are enjoying meat-free meals in ever-increasing quantities, for health reasons and personal preference as well as for ethical considerations. 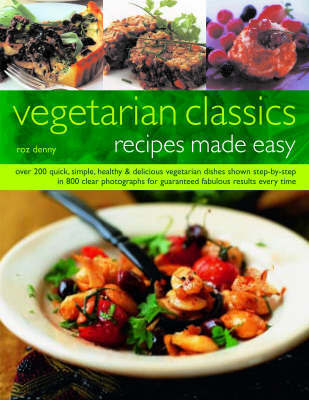 Whether you are a committed vegetarian, whether you like to vary your routine with meatless dishes, whether you are cooking for yourself or a large family, this book will provide a fabulous range of continual fresh and inspirational ideas. In the introduction you will find valuable advice and information on ingredients and nutrition to allow you to make the most of vegetarian cooking and ensure a healthy diet. Then the main section consists of over 200 delicious recipes for appetizers and soups, starters, main courses, side dishes, supper dishes and desserts - perfect and tempting dishes for every occasion. The book gives wonderful recipes for vegetarian party canapes, for perfect picnic food, for nutritious children's meals, for formal dinners and television suppers. Classic favourites include Vegetable Paella, Spinach Gnocchi, Cabbage Roulades, Shepherdess Pie, Tabbouleh, Cauliflower Cheese, Cowboy Hot Pot and Stuffed Artichokes. All the recipes are easy to follow, with step-by-step photographs and inspiring finished shots of every dish. They make the most of the wonderful variety of ingredients widely available today, including vital protein-rich food and tasty herbs and spices.